After training primarily as a violinist, with Manoug Parikian at the Royal Academy of Music in London, Christopher Adey was a member of Sir John Barbirolli’s Halle Orchestra before joining the London Philharmonic Orchestra. His conducting debut led immediately to his appointment as Associate Conductor of the BBC Scottish Symphony Orchestra from 1973-76, since when he has pursued a freelance conducting career, appearing with orchestras throughout the UK and Europe, as well as in the USA, Canada, South Africa, India and the Middle and Far East. 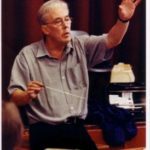 A specialist in orchestral training since early in his career, Christopher Adey has always maintained a profound commitment to youth and student orchestras and has worked with county, national and international youth orchestras in many parts of the world. Principal Conductor of the National Youth Orchestra of Wales from 1996-2002, he held the post of Chief Conductor and Artistic Director of the Royal Oman Symphony Orchestra from 2000 to 2004. In addition to other regular commitments, Christopher Adey is currently Conductor of the symphony orchestra of Wells Cathedral Music School and Principal Guest Conductor of the Orchestra of the Music Makers in Singapore. A Principal Conductor and Professor of Conducting at the Royal College of Music from 1979 to 1992, he remains in constant demand at conservatoires throughout the UK and his book “Orchestral Performance: A Guide for Conductors and Players”, published by Faber and Faber in 1998 (now available as an e-book), has become a standard work on the subject. Christopher Adey is an elected Fellow of the Royal Academy of Music, the Royal College of Music, and the Royal Welsh College of Music and Drama, as well as an Honorary Vice-President of the Welsh Music Guild and, in recognition of his particular services to Czech music, a recipient of the Commemorative Medal of the Czechoslovakian Government.